Following an uninspiring spell of winter weather here in Blighty, the sunshine of spring has made some pleasantly unexpected appearances lately. Peeping through tears in tempestuous clouds of grey, warm rays of light are streaming onto our parks and playgrounds; prompting us to consider essential groundworks before the arrival of heavy footfall. Sometimes an existing play area might simply need a light refresh, rather than a complete overhaul; and surfacing is a great way to do just that. PlaySmart have recently undertaken such works on three Bristol-area parks, just in time for the arrival of the glorious summer sun. In the first instance, we used vibrant green JungleMulch to rejuvenate the existing wooden equipment – which looks great against a backdrop of street art. 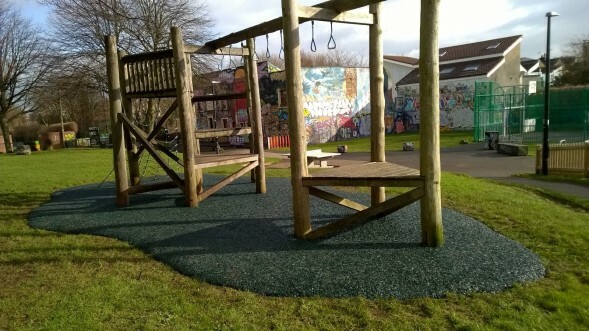 In the second, we used our original rubber mulch blend to really lift an urban playground that gets a lot of use, providing a durable surface that will keep its bright colour for a long time. In the last example, an uneven problem-area next to existing playground surfacing was transformed by incorporating a RubbaSmart slope into the existing surface. The detail in the colours disguised some existing marks and added a bold new look to the space. If you’re considering similar groundworks on your site and would like to speak to an expert about your options; get in touch with the team here at PlaySmart! You can contact us by phone on 01564 742 811, or you can head on over to the contact page, here. We’ve also just published a comprehensive guide on the benefits of grass mats as playground flooring. It’s completely free and you can download it here.